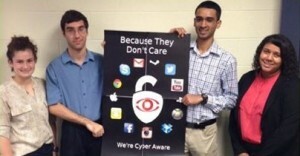 It’s never too early – or too late – to educate people about safe online behavior, and our Seidenberg students know this! (L-R) Amanda Perez, Brian Bounos, Joel Thomas and Jalyn Robinson, present their ideas. October is National Cyber Security Awareness Month (NCSAM) and the Seidenberg School has joined with the Department of Homeland Security and its partners across the country to highlight the importance of cybersecurity and online safety. As part of this effort, Seidenberg first-year students in Dr. Bernice Houle’s UNV 101 class took the lead to share responsibility for online security by promoting cybersecurity awareness. The students worked in groups to create a poster and two videos that highlight three distinct cybersecurity-related issues. For more information on NCSAM 2014, visit www.dhs.gov/stopthinkconnect/national-cyber-security-awareness-month. To receive cyber security tips year round, visit www.dhs.gov/stopthinkconnect and become a Friend of the Campaign. The Stop.Think.Connect. online toolkit is filled with tips, facts, and shareable resources for several audiences, www.dhs.gov/stopthinkconnect-toolkit.